Note: I’d like to give a big thanks to Kurn for her help is preparing this post. ❤ Even without seeing the logs, she was able to catch some things I didn’t. We’re working on Lich King [10 man] and we’re dying a lot to Infest, especially when I [disc priest] get picked up by Valks. Can you show me log-reading tricks so I can figure what our healers are doing wrong? It’s a bit strange writing about World of Logs (and the LK fight) this late into the expansion, especially with the patch coming out tomorrow and most everyone being stalled for a few days. Hopefully, though, WoL won’t face too many changes. While the fight will soon be obsolete, I’ve got my fingers crossed that working with WoL will essentially stay the same. As usual, if any of you readers see something I missed, feel free to weight in. Only keep in mind that the raiders in these parses are not my thick-skinned, accustomed-to-being-blogged-about guildies. Most of them don’t know they’re making an appearance here, so please be tactful. Also note that they have killed Lich King and this is really just an exercise in WoL reading. After an evening of wipes, you’ll want to look at any attempt that lasted longer than a minute or two. For the sake of this post, I’m going to pick Try #5. At 5min47s, it’s long enough for stuff to happen, but short enough to make the graphic editing simpler. Since I’m looking at deaths and, thus, causes of wipes, I want to take a general look of what happened during this attempt. 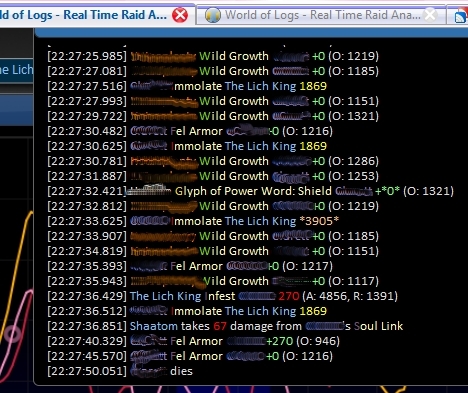 World of Logs graphs different aspects of the attempts, notably your raid’s damage output, your raid’s healing output and the damage taken by your raid. To get an overall picture of a multiphased fight like the Lich King, I’m going to go with Damage Taken. And now you see a nice collection of squiggly lines with a few straight lines cutting through them. The red squiggly line represents the damage taken by the Death Knight tank and the pink squiggly line represents the Paladin tank. By what we know of the Lich King fight and the damage patterns, we can assume the DK is tanking Arthas and the pally is the offtank. I have the pally tank’s damage spikes circled in green. What’s causing those spikes? Likely a new Shambling Horror or an enraged Horror. After the third green circle, the damage dealt the the main (DK) tank drops. This is probably the beginning of the transition phase. Arthas walks away and, until the first Raging Spirit is summoned, the DK isn’t taking any damage. During the transition phase, you can see a few damage spikes for both tanks- each one probably represents picking up a Raging Spirit. A section of the transition phase is also highlighted in blue: this is heroism. This can tell you a bit about the raid team’s strategy. In this case, we suspect that they struggle a bit with finishing off the Raging Spirits at the end of the first transition phase, but since there aren’t any deaths here, it’s not really of interest. 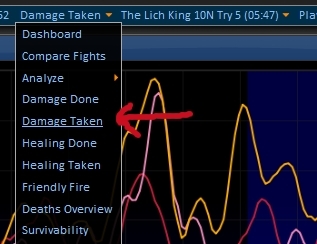 The huge damage spikes on the DK are most likely Soul Reaper hits. Some of those spikes aren’t as pronounced: either the tank or one of the healers must have used a cooldown. Through the whole fight, you can see a third, yellowish, squiggly line dancing across the bottom. By default, WoL will show the top three raiders for whichever meter you’re looking at, in this case, both tanks and the rogue. You can change which lines are shown by checking or unchecking the boxes in the list under the graph. The image above is the default settings. If you were wondering, the humps of damage taken by the rogue were probably Infests. The yellowish spike near the end is an Infest death. Step 2: How Did We Die? Notice the vertical lines cutting across the graph. These highlight important moments during the fight, typically a death or a battle res. Lets mouse over the first line. If you say Infest, you’re wrong. This death recall goes over the last bits of damage taken by the player which, in this case, were certainly Infest ticks. But look at the timestamp: the lock died 13 seconds after the last Infest tick! If she had been killed by the debuff, her death would share the same time as the last tick. A is the amount of damage absorbed. Absorbed damage is mainly the result of a priest Shield (but there are other sources of absorption). R is the amount of damage resisted. This is typically due to elemental resistances, like a paladin aura. Neither absorbed not resisted damage harms the target. Had our Warlock friend died, there would have been an O:number as well. O on incoming damage logs represents overkill, the amount of damage dealt over the amount needed to kill that player. So what killed our friend? Lets look a little closer at her death log. If you right click on her Death Line (you know, like the picture says “rightclick for more info”), you get a drop menu. Select “Death Log of *player*” and you get a new window. You can see here that she was at full health when she died. When an O is next to a green number (a heal), it means overheal. We have no other information about her death, meaning she died an environmental death. In other words, either she got dropped by a Valk or she fell off the edge. 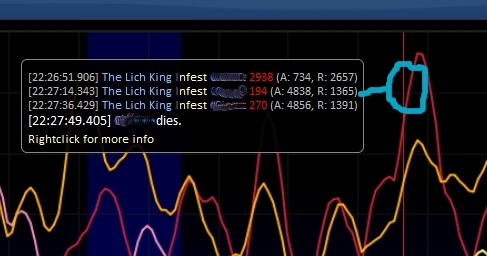 The log snipped also shows that the only actions she performed over the 23 seconds before her death were the remaining ticks of Incinerate, suggesting she was in a Valk’s clutches during this time. It’s also very unlikely for a ranged dps to accidentally run off the edge during this phase of the fight. By using another feature, the Log Browser, I was able to look up the timing of the Valk and confirm that one was summoned about 30 seconds before she died. And there’s about 30 seconds between a Valk summon and a Valk death. For the sake of simplicity, though, using the Log Browser feature will be the content of a separate post. Now that we’ve looked at the first death, lets take a peak at the others. 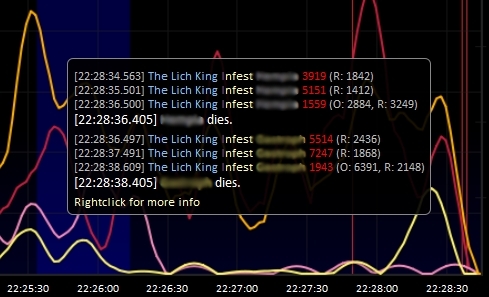 Check the timestamps, check the overkill numbers… These are definitely Infest deaths. Going by the death log and the Log Browser, the Disc Priest might have been in the clutches of a Valk, but a disconnect or a wipe being called are also possibilities. 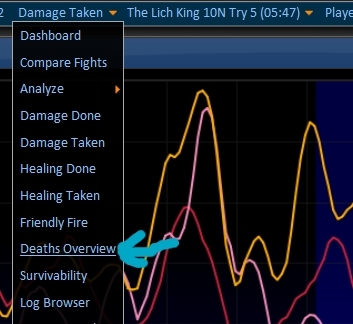 If you’ve played around with WoL, you’ve probably noticed the Deaths Overview option. Selecting it and you’ll find this. When reviewing individual 10 man attempts, I prefer looking at deaths directly from the fight graphs. But! But if you want to do a quick review of an attempt with a lot of deaths (I’m thinking 25 mans) or if you want to compare several attempts, you’ll love this option. It’s all laid out in front of you. Be careful, though, the shortened death logs don’t show the final death timestamp, so Valk and running off the edge deaths could be mistaken for Infest deaths. Also feel free to look at the bigger picture by clicking the “more” link (circled in blue on the picture). After looking at all of this teams recent Lich King attempts, I made a pretty interesting discovery. Most of those assumed Infest deaths? Actually misread Valk deaths. Since this team can get Valks down, dps isn’t really the problem. My guess is that target switching is the main issue here. My recommendation? Have the slow switchers turn on enemy health bars. I’ll write a few words about the Log Browser this week (hopefully! ), but for the time being, I’m going to join the rest of you with The Great 4.0.1 Scrambling of 2010. And here’s a little game to see if you’ve been paying attention! We have two simultaneous deaths here, a rogue and a druid. The circumstances are a little amusing. Using only this log snapshot, can you guess what happened? Hint: These deaths occurred in phase 2. This entry was posted on October 11, 2010 at 8:11 pm and is filed under World of Logs. You can subscribe via RSS 2.0 feed to this post's comments. Hm. Neither were killed by infest or defile. They die one right after the other. There’s no sign of damage done from Remorseless Winter, so they weren’t in the middle too long for a phase change. I’m going to guess that the druid was picked up by a Valk and the rogue ran off the side of the cliff after he realized he had defile on him? Close! And a possible deduction from the limited information we have there. What actually happened is way cuter, though. My guess is the rogue spread for defile in the same direction the valk, which picked up the druid, was flying, dropping it in the path. Trying to get into place between the edge and defile to get that last stun off to save the damn druid, he fell off the edge. Sadly, the druid was also dropped. Edit by Ophelie: No cheating plz! Assuming it’s normal I would say that one of them was dropped because the Valkyr flew right through the defile and they didn’t have enough ranged – I guess it was the druid and she was a moonkin? The other one tried DPSing the Valkyr but forgot to stop running after her after she flied over the edge. Note: The defile tick is about 15 seconds from the rogue’s death, I don’t think it took her so long to realize she was targeted by one. I’ll guess that tha rogue was picked up by a valk, and the druid was done in by a late feral charge, accidentally pouncing themselves off the edge. Ah, but it only takes the intellectual ability of a monkey to look at dps meters. I wanted to point out that there’s a lot more to get out of WoL than just meters. Their dps is below the ideal, but since they’re getting through their phases at a reasonable speed and they can down Valks when everyone’s at the top of their game, they do have a enough dps to beat the fight. So generally in 10 man the faster you are at Valks are the better you will be at handling say infest because if your healer is picked up you can free him quick. For the most part, I think they’re not switching fast enough, but you can’t see it from the few pictures I posted here. Was going to go more into that when I get around to writing about the Log Browser. Of course, the higher the dps, the easier it is.